S30 Engine swap - but which engine? Discussion in 'Hybrid Z cars' started by Tony 260Z, Nov 2, 2017. I'm thinking about an engine swap for my 240Z (thought about it for years for the 260 too but never did it) but I don't really know what to go for or what budget to think about. Let's assume I'll have to pay someone to do the work - I can help but as soon as I go away from carbs I'm out of my depth. To be honest I'm not as fit and strong as I used to be either. I'm not looking for mental amounts of power but an everyday reliable motor with about 300 brake would do the trick. (i) Convert my carbed L28 with F54 block and P90 head to an injected turbo? I already have a turbo exhaust manifold in my goodie collection which is a start I suppose. (ii) Put in a VQ35. It's a Nissan, 6 cylinders, relatively plentiful and affordable. Not far shy of 300 brake in stock N/A form. (iii) Put in a turbo 1JZ or 2JZ Toyota lump. Easy 300 horses with many more available should I go that route in the future. (iv) Put in a small block Chevy V8. Been done a thousand times, lots of power, great sound, scary mpg. I suppose the advantage of strapping a turbo onto the motor I've already got (that would have had one in its' previous life) is simplicity. I can stick to the ZX gearbox I've got for a start. But, if I decided I wanted to go the swap route how much should I budget? The VQ, JZ or Chevy routes need gearbox swaps too. And can anyone recommend someone to do the job? Can anyone on here local to Essex to do it? All advice and thoughts welcome! If you are happy with turbo power over N/A I would work with what you already have and strap the turbo manifold in with a decent turbo. 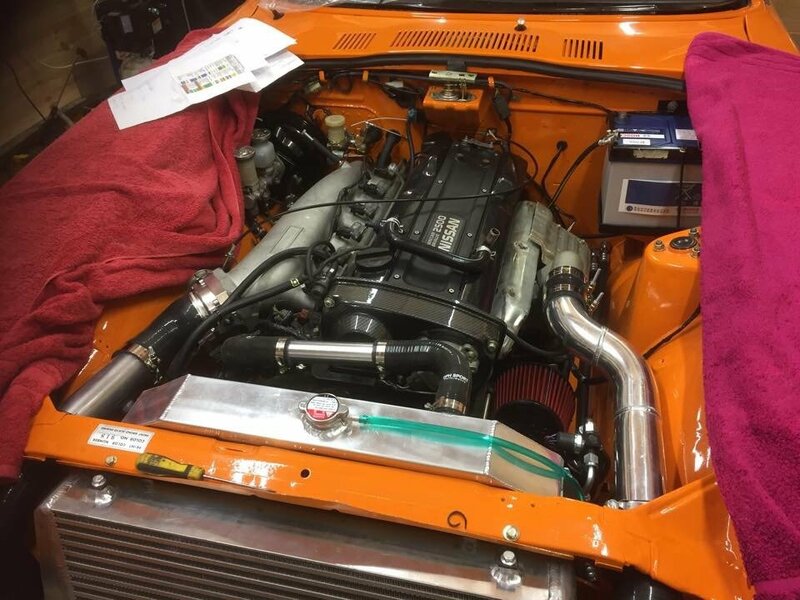 You will then only require fitting an intercooler, the relevant intercooler piping, oil feed for the turbo and oil drain going to the sump and an engine management system with appropriate injectors on a 280zx intake manifold and away you go. Oh,,, nearly forgot you'll also need a dizzy from a 280zx turbo and the oil spindle from one and a turbo oil pump and a boost gauge to keep an eye on boost and a lambda gauge to make sure your mixture is right but it should be if you have her properly tuned. That's about it really. You'll need to upgrade your gearbox as you will kill it eventually, so budget also for an S14 gearbox and if you've got an R180 diff, change it for an R200 preferably a 3.54. And this one nearly got away Tony, you will need to modify your fuel tank, there is no adequate baffles in a 240z tank and you'll need to add some or run a surge tank.You will also need to run a larger diameter fuel feed line, some people use the existing fuel feed line as the return, make the old return redundant and run a new wider diameter fuel feed from the tank to the engine bay. PS - I've probably forgot one or 2 other bits you'll probably need eg just remembered a boost controller, dump valve etc... But that's pretty much it..
What are you planning to do with your car Tony - I mean use-wise ? IMO a modern engine is a great way to go and create a very practical all rounder car. You get the superb looks of an S30 and the practicality of modern technology. My only advice when choosing an engine is to keep it factory standard so you enjoy all the benefits of the manufacturers R&D. My choice would probably be an RB25det. These are great engines in their standard form and fit the engine bay perfect. Off the shelf mounts are available to make it a bolt in job so no fab costs. Its been done a thousand time so loads of info available. I still love my 1J, even though I drifted away from standard form when it was at its best for driveability. It drives great and I get over 30mpg. I'm always happy to help Tony but have too many projects of my own to take on something like this. You know what I think. Modern LS variants great on power and better on mpg. Crate engines readily available with horsepower to suit your pocket. Something makes me shudder when a V8 sound is emitted from an S30 shaped car ... and not in a good way. I have no experience of engine swaps in these cars at all but I know what I wouldn't want! Some of the above suggestions sound good though. Having just done one my money would be on a rb25det. It fits in perfectly . etc are available off the shelf. Looks great with the aftermarket intake. Although I said keep it standard, this is the only mod I would make to the 25. You can get 'about 300' bhp with an NA L-Gata. Not sure how costs would compare to RB25 etc, but it can be reliable and is simple to install. I would imagine it would cost at least 4 times as much to get 300hp from an l-series and you won't have a silky smooth drivetrain that gets superb fuel consumption and would last another 100,000 miles. I'm not saying I don't like zeds with l-series as that's exactly what I'm keeping in the silver car, I just need a hybrid or 2 to complement it. I would like to see a normally aspirated straight six installed in your car Tony. Surely there is a modern, multi-valve, fuel injected engine available? I had an R33 skyline with RB25de engine and loved it as a GT car. Went to Paris in it a couple of times and it would eat up the miles effortlessly. The problem with a lot of the "nice" straight 6's is the intake tract length. In order to get the drivability they had to make it long so it would cross over the rocker covers and totally ruin the look of the engine. I have seen quite a few modern straight 6 jag engines with ITB's that look good but are not that nice to drive at low revs. Yep, the standard Rb25det inlet manifold with the over the top pipework is hideous isn’t it. Bought my Z with the intention of an RB lump going in. But the idea of turboing the L series is becoming more tempting. Decent Ecu, get a manifold made, some sort of gt30 turbo, intercooler, upgrade the injectors and fuel rail and get rid of all the ugly emmisons stuff from the 280z inlet manifold and it’s a relatively easy 300+ horsepower. Been adding the costs up for the RB conversion and know full well I’ll end up going with a top mount turbo and aiming for nearer 500 horses, then the back end of the car is going to start getting expensive to handle the extra power lol. Manual gearbox’s for RB are getting scarce too. The RB25 has to be the best turbo swap for all the right reasons*. For a N/A swapped 6, it has to be the M3 engine. *except one which is period looks - I can't comment on feel as I've never driven one. But these are swaps, changing the heart of the car and people do them for their own, good personal reasons......but ffs not for better fuel economy and motorway mileage ! C'mon, I read someone here saying they prefer their turbo D for m-way torque ! Personally, I don't like turbos, I was going down the M3 path but some 6th sense told me to stay N/A L-gata and perhaps only time will tell if I was right or not. Until then, when I open my bonnet, I'll see triple twin-choke bodes on the L engine. I do like RB25's but, they are all getting a bit old and may need a rebuild. For value for money I would have thought a 350z Motor and Box would be a good bet. Easy 300 Brake with exhaust and map and loads of torque. Also I don't think anyone has done it over here yet? Lots of help from the states though, see below.